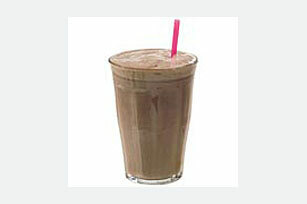 When the summertime hits, sometimes all I want is a sweet chocolatey milkshake. But there is no need for me to run to the next hormone-filled, mucus forming concoction available at the nearest diner or Starbucks. No, no. I’ve got something better. I call it the Feel-Good Coco Mocha because it tastes like a Java Chip Frappucino but has an extreme amount of feel-good nutrients that will leave you with a feeling of awesomeness instead of a sugar crash. Perfect for a post-workout or for when you just need a pick-me-up. I promise—you will be hooked! Throw it all in a blender and hit blend! Coconut water: Coconut water is extremely hydrating, and contains the electrolytes potassium and magnesium. Magnesium is extremely helpful for reducing stress and belly fat, whereas potassium is great for rehydration. Chia Seeds: I know I talk about chia seeds all the time, but that’s because they are AMAZING. The tahamurara tribe drinks water with chia seeds to fuel up for 3 day, 50 mile runs (check out the book “Born to Run” if you want to learn more about them). The seeds absorb water, giving the smoothie a thicker texture and making it more filling. Cacao: Cacao is a nutrient-rich superfood. Who would’ve though chocolate could be so good for you? Cacao also has magnesium, along with serotonin (which is often deficient in those suffering from depression). In addition, it has more cancer-fighting antioxidants than green tea, red wine, and goji berries combined! Carob: Although not as nutrient dense as cacao, carob powder is a great source of calcium and has less caffeine and calories than cacao. Both forms of chocolate have excellent cancer-fighting properties. Avocado and Almond Butter: Tons of fatty acids to keep you satisfied and to keep your skin glowing and radiant! Not to mention, its absolutely DELICIOUS, if I do say so myself. Enjoy!